¿Prefieres el curso en Español? Click aquí. In this online course I share 5 of the Fundamentals that I take into account to craft my football videos, both in theory and practice. We will be creating a football video live, with tips that you can then incorporate in your own workflow. Course was held live on 23 May, but you can access recorded video and all the material. What is the course about? What am I going to learn? In this online English-taught course “How to craft beautiful football videos”, I share 5 of the Principles that I take into account to craft my football videos, both in theory and practice. We will be creating a football video live, which you can then incorporate in your own workflow. Course was held live on 23 May 2018 (9pm UK time, 10pm Germany time, 4pm EDT), but you can access recorded video and all the material. The message matters. Using the right hierarchies and colors increases the likelihood of getting the message right: To allow one´s audience to do what one wants them to do, or to make them understand what one really wants them to understand. In times of constant bombardment of information and of fierce competition to gain every person´s attention, it gets critical to ensure that every single piece of content receives the right format (style, duration, etc) so as not to blur its objective: To make one´s audience do what one wants them to do. The Football world is not only part of this phenomenon, but also in many cases this phenomenon exacerbates. 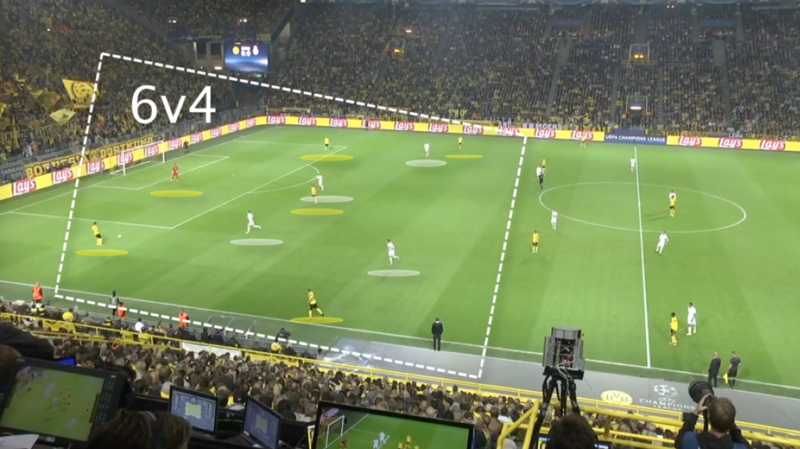 Often times, many Coaches/Tactical Analysts have many good ideas, but they soon find out that it gets hard to put those ideas in an optimal, consolidated, taylor-made video. How can I, as a Coach, make sure that my players pay the proper attention, and that they get and understand the message that I want them to deliver? How can I, as an Analyst, make sure that the Coach understands my message and gives the proper attention to my suggestions? – Clubs or Federations Tactical Analysts (both amateur and professional). – Bloggers (o Vloggers) who want to enhance their videos. – Curious minds who would like to belong to the aforementioned audiences in the future. This course will be taught in English. If you are interested in the Spanish-taught course, please follow this link. The course has 2 big modules: First, I will be sharing an overview of the 5 Fundamentals that I normally take into account for crafting my own videos. Second, we will be creating a football video using Camtasia (which you can then download), applying these 5 Fundamentals. During the course, I will be using Camtasia 2, for Mac. However, these same 5 Fundamentals can be easily applied in most other traditional video softwares, such as Klipdraw, Adobe Premiere Pro, even ChryonHego, etc. The price of the course is US$24.99 US$9.99. You get lifetime access to the course and all the material. You can pay via PayPal using your debit/credit card (no need to have a PayPal account), or your PayPal balance. It´s in this intersection between football, technology and education where I am interesting in adding value. If you want to know more about myself, here´s the link to my profile on LinkedIn. We will be using the Begin with the End in Mind approach. What does this imply when thinking about my videos? Does it matter who this video is for? Does it matter from which device this video is mainly going to be seen? If so, what formats should I take into account in order to optimize for my objective? Best Practices around colors, fonts, hierarchies and contrast, that I normally use in my videos. I will be sharing the main elements that I tend to use (circles, arrows, transitions, shaded areas, etc.) when crafting my own videos. How many times can I watch the course? As many as you wish! Even though I am going to hold the course live, you can either attend live, watch it later, or both. Is this a course on Football Analysis? Do I need to buy Camtasia or other software? Not at all! It is very important for me to emphasize on the fact that you don´t need to download/buy Camtasia or any other new software. What you will learn can be applied to your favorite video platform. Once I pay, what do I have to do? Is there any Certification/Diploma for attending this course? Reserve your spot and get ready to learn!